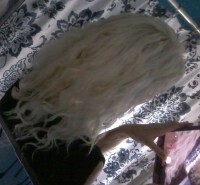 so my roots are straight, the shaft of my hair is like 2b waves, some 2a, and my ends get like 2c/3a curls. but they’re SO fragile. i touch them, they’re gone. i comb my fingers through them, they’re gone. just being outside or putting my hair in a bun results in my hair loosening and looking really odd. is there any way i can make them hold longer without making them feel crunchy or hard? Definitely take the advice from the ladies above. I would add that your hair is very normal for type 2 hair. 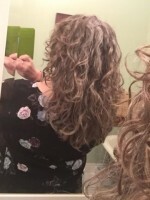 Roots are typically straight and get curlier on the way down. Don't comb through your hair when it is dry, and try using a hard hold gel. It will cause them to be crunchy but you can easily scrunch out the crunch and get the staying power without the crunch effect. My hair is the same way. I would suggest getting a trim, even just the ends. I'd ask for long layers. Also, I'd use gel, but not too much of it. Have you tried doing a protein treatment? Sounds like your hair needs some strength. 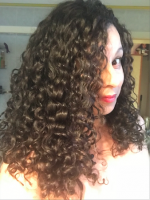 i got a trim in june and got layers during that trim, and it helped with the curls/waves forming easier and i find that gel makes my hair feel too crunchy and oily looking. but thank you i will try it out! i haven’t, but i’ll definitely try it out. thank you! i’ll be sure to try this out, thank you!